The cover of this book alone induced gasps of admiration. The story got them talking. At its end, Esky said, "I feel bad, because reading this I kind of wish something bad happened to me so I could have a service dog." I doubt Esky appreciates the gravity of the struggles service dog-users have, but she really wanted me to grasp the depth of her want. I'm getting it, Esky. More on the book now. 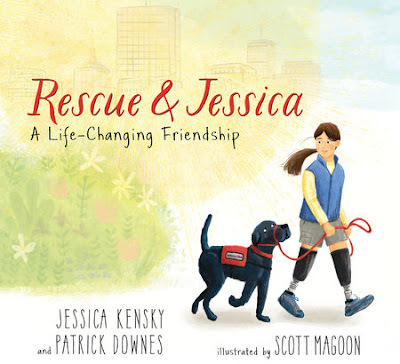 We love the inclusion of biographical notes, accept the adaptation to a younger protag, manage the dual perspectives (Jessica AND dog...and it works!) and respect the pacing (this picture book has gentle suspense!). I appreciate how well this story expresses a mutually beneficial relationship and how aptly the illustrations render darkness into Jessica's battle. This came at just the right time for us (not long after Esky's birthday and at the peak of animal fever). It only makes the girls appreciate animals more and, I hope, empathise with the struggles others face a little better. We highly recommend Rescue & Jessica. (P.S. The hardback is lovely). If you're feeling an itch, here are links to donate to the SPCA, WWF, or NEADS (a nonprofit that provides highly skilled service dogs for people who are deaf or have a disability).